My own dear boy, I’m proud to call you mine! – extract from Rev. John Pollock’s poem to his son Paul. 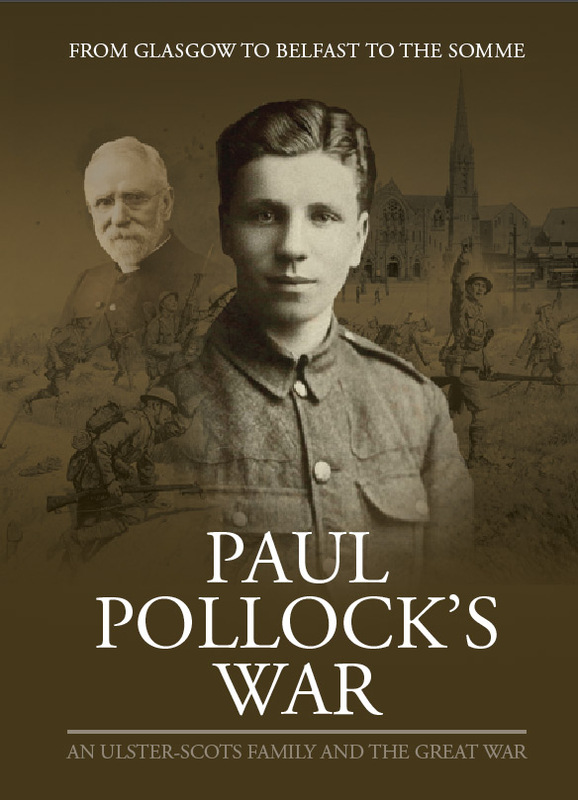 Glasgow-born, Paul Pollock (1896–1916) was one of the thousands of young men killed in the Great War. His body was never found and until recent years his name was not recorded on the Thiepval Memorial. The letters he wrote home, from July 1915 until June 1916, have been treasured by the family ever since. Revealed in this book for the first time, the letters paint an intimate picture of Paul’s experiences as a young man in the Royal Irish Rifles, of his friend the war photographer George Hackney, and of the admiration and anguish of his father, Rev. John Pollock of St Enoch’s Presbyterian Church in Belfast. This 100 page book is the work of Mrs Elizabeth Bridges and Peter Fisher. Born and raised in Belfast, Mrs Bridges is Rev John Pollock’s granddaughter. In the century since the Great War, the family had treasured the remarkable collection of Paul Pollock’s war letters and brought them to the attention of the Ulster-Scots Agency in 2013. In addition, Peter Fisher had carried out genealogical research into the family’s Scottish mercantile origins, and so the book traces an Ulster-Scots family lineage from the early 1800s to the present day. A number of appendices provide further detail, on St Enoch’s Presbyterian Church in Belfast (then the largest Presbyterian Church in the British Isles), the Scotch-Irish Presbyterian Reunion which was held there in 1884, Christian Endeavour, George Hackney, Presbyterian Memorials and the Great War and also of Royal Belfast Academical Institution (“Inst”) and the Great War – Paul Pollock’s name features on the War memorial at the school. Through the efforts of Alan Curragh, Paul Pollock’s name, once absent from the Thiepval Memorial in France, has recently been inscribed there. 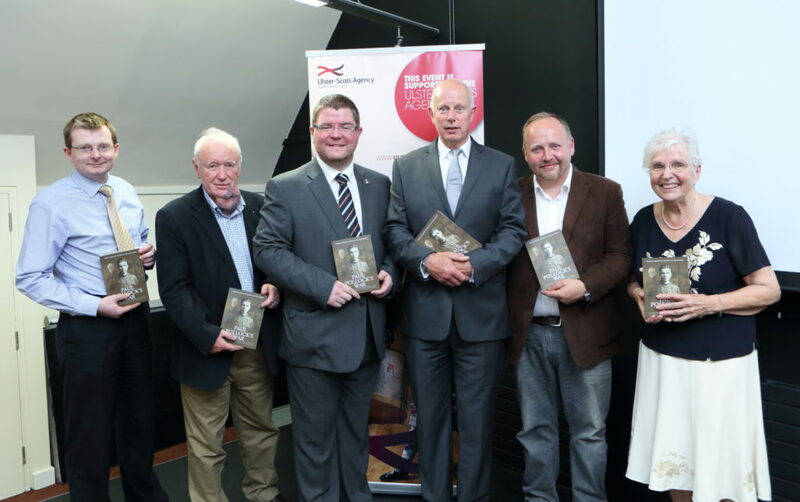 Photographed at the official launch of ‘Paul Pollock’s War’ (L – R) are Dr. William Roulston, Director of Research at the Ulster Historical Foundation; Tom Scott MBE, Chairman of the Ulster-Scots Agency; Ian Crozier, Chief Executive of the Ulster-Scots Agency, Peter Fisher, author of the Pollock book, Mark Thompson, designer of the book and Director at Rodgers Thompson Partnership and Elizabeth Bridges, Paul Pollock’s niece.